Annals of Economics and Finance (ISSN 1529-7373) is indexed in Social Sciences Citation Index (SSCI), Scopus, ABI/INFORM, and EconLit. 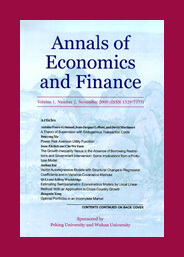 AEconF.net & AEconF.com, the electronic editions of the Annals of Economics and Finance, are publishing all articles from the current and previous issues of this journal. They are free to view and download. Your contribution to the Annals of Economics and Finance is greatly appreciated. Click submission to learn more about how to do it.